Note: The following article appeared in the January-February, 2008 issue of Bottles and Extras (pp. 43-45), bi-monthly publication of The Federation of Historical Bottle Collectors. It won the FOHBC First Place Award for "Best Research Article" in 2008. In 1893, James Esposito and his brother, Vincent, emigrating to the United States from Casoli, Italy, were thrilled to see the Statue of Liberty as their ship entered New York harbor. After passing through immigration on Ellis Island, the brothers made their way to Philadelphia, Pa., where they found work as bakers in a predominantly Italian neighborhood. They boarded at Frank Polumbo’s halfway house at Eighth and Catherine streets. (Polumbo later opened a popular night club). They worked hard and saved enough money to open a bottling business at 706 Fulton Street. In addition to becoming distributors of Poth’s Beer, they manufactured a wide variety of soda waters, selling them in a wide variety of Charles Hutchinson’s bottles embossed with an American flag. Hutchinson was the son of a Chicago bottler who patented his internal stopper system in 1879. It was the Esposito brothers’ way of paying homage to their adopted country, letting everyone know they were proud to be Americans. 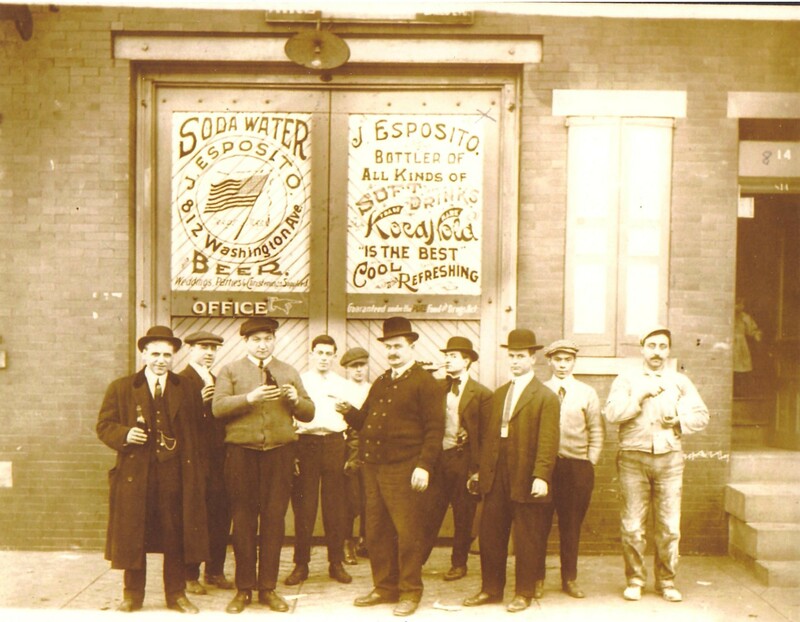 Their bottling business was successful, but about 1900 for reasons unknown, James Esposito, just 24 years old at the time, decided to pull out of the partnership and establish his own soda water business. He purchased adjoining houses at 812 and 814 Washington Avenue, with the larger, five-bedroom house at 812 serving as the family’s living quarters because he was married and had fathered children. 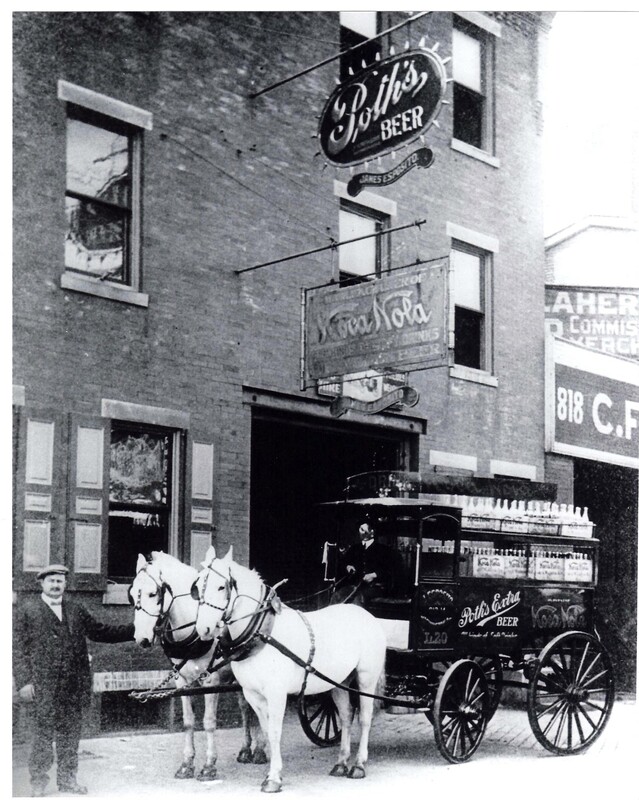 The house next door sometimes served as a temporary residence for other Italian immigrants who sometimes worked at the bottling business located in a garage between the two dwellings. James Esposito is holding the horses as a friend occupies the wagon seat. Check out those wooden Koca Nola cases. Photo courtesy of Bob Esposito. James Esposito and friends, each with a Koca Nola in their hands, celebrate circa 1910-1914. James is in the center of the group, and his two young sons, Anthony and Jimmy, are in the background, center. The little girl in the doorway is his daughter, Mary. Photo courtesy of Bob Esposito. As his business grew, James built a large, two-story addition to the garage-bottling plant that extended all the way to Alter Street. During the renovations, the business was moved to 612-614 Fitzwater Street and Hutchinson bottles bearing that address exist. Later, the business returned to its Washington Avenue addresses. He continued the tradition of ordering flag-embossed Hutchinson and crown-top bottles that saluted the country’s free enterprise system. Only in America could a poor Italian immigrant achieve great success at business through hard work, honesty and shrewd business sense. Bottles embossed Jiacomo Esposito and Giacomo Esposito, the equivalents of "James" in Italian, also exist. (Note: There is no "J" in the Italian alphabet, according to Bob Esposito, James’ grandson, so Jiacomo is a misspelling). 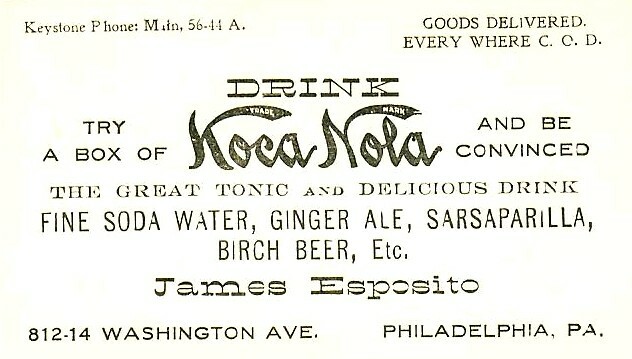 In the spring of 1905, James Esposito became one of the first bottlers to be awarded a franchise from the fledgling Koca Nola Company in Atlanta. 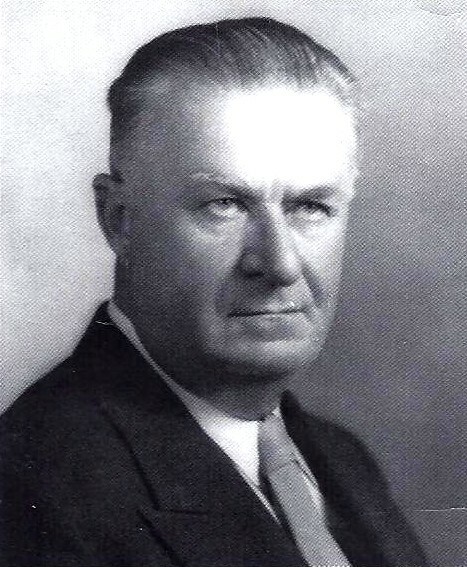 Entrepreneur Thomas H. Austin organized the soda water company in February of that year. That same year, James also helped organize the South Philadelphia Sons of Italy. Cardboard Advertising Sign Circa 1910. Photo courtesy of Bob Esposito. He probably sold more Koca Nola than did bottlers of the drink in 15 other states and the bottles in which it was sold have become collector’s items. The Hutchinsons come in aquamarine, citron, straw yellow and honey amber. Later crown tops come in clear, aqua, teal and amber. At some point in late 1905 or early 1906 it appears that James bought his brother Vincent's bottling plant at 706 Fulton Street, as quart Koca Nola crown top bottles exist bearing both that address and James' name. Hutchinson bottles with an embossed American flag and the 706 Fulton Street address and James' name also exist. James Esposito's Business Card Circa 1910. Photo courtesy of Bob Esposito. 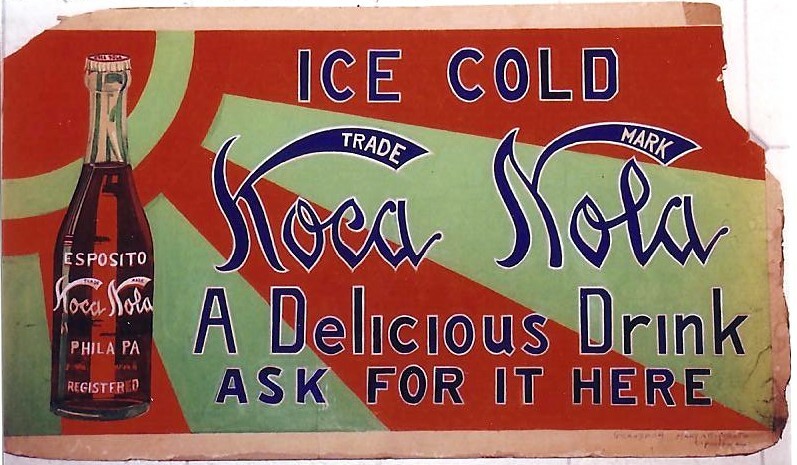 The Coca-Cola Company in 1912 took James to federal court to stop him from using the Koca Nola bottles because of the similarity in names. The case took more than 10 years to decide, but in 1922 Esposito finally lost the case and changed the name to Espo Cola and later Trio Cola, but the federal judge blocked those names, too. So James again switched names, to Primo Cola, and the judge approved the name. Perhaps there was a family joke there. Primo in Italian means first, something the judge probably didn’t realize. The Austin company itself in 1910 lost its case after being sued by the federal government for reportedly having cocaine in its formula. The appeals process kept it in business, still shipping the syrup to its franchised bottlers, until 1914. But James Esposito continued to sell the drink for eight more years, apparently having wholesale amounts of the syrup on hand. Trio Quart Paper Label Circa 1922. Photo courtesy of Bob Esposito. 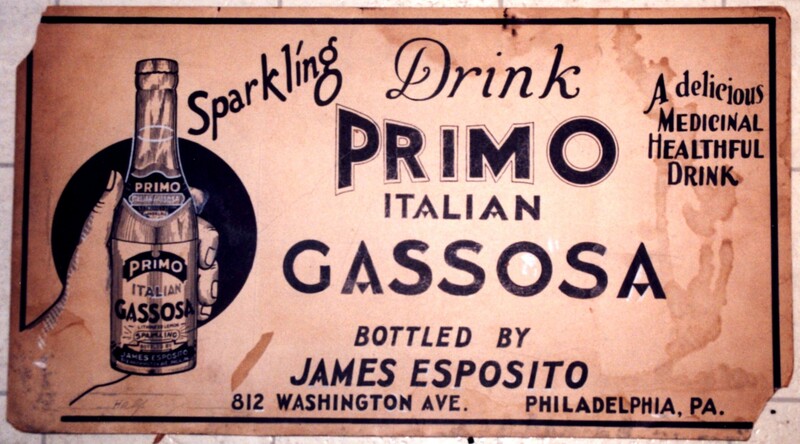 Later during the 19-teens, James began bottling a lemon-and-lime soda he named "Primo Gassosa." The second word meant carbonated soda in Italian and the syrups from which it was made were imported from Italy. Cardboard Advertising Sign Circa 1920. Photo courtesy of Bob Esposito. According to family members, the drink became very popular and James thought it was the best carbonated soft drink. James became famous in his native Italy and in 1922 traveled back there to accept an award for achievements in business at the Italian Manufacturing Exposition. His daughter-in-law, Mary Cipollone, nee Esposito, was an artist who turned her talents into designing paper labels for the company soda bottles, as well as many marketing items. 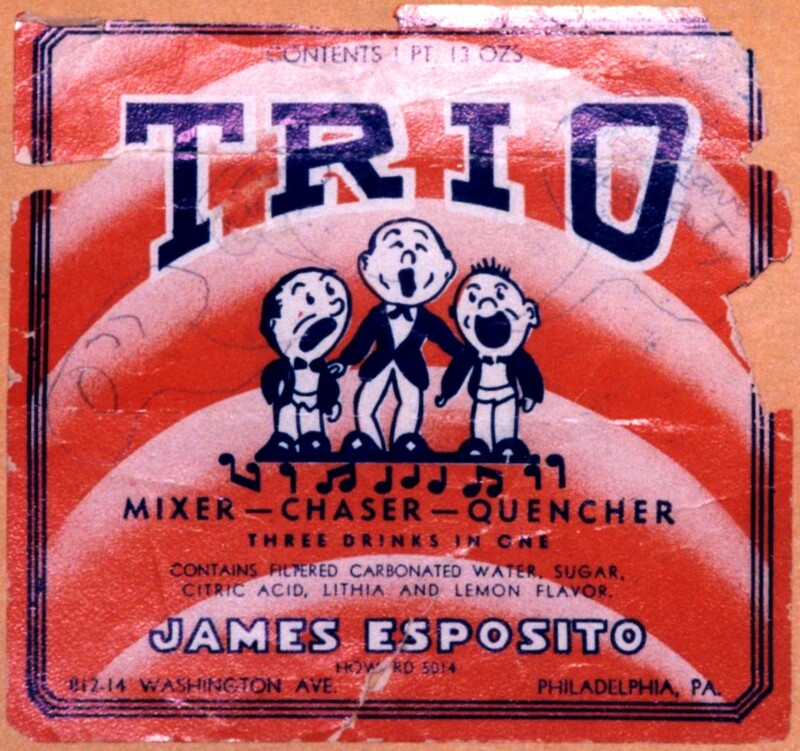 During the early 1930s, representatives from the 7UP Company in New York approached James in hopes of interesting him in a Philadelphia franchise. He turned them down, saying he would make his Primo Gassosa soda bigger and better than their drink. 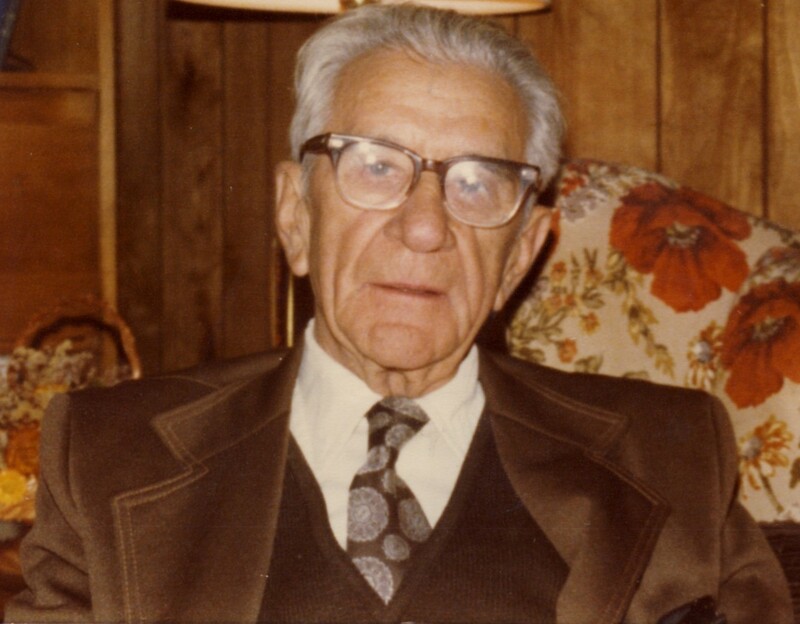 James Esposito, age 60, founder of PRIMO Beverages, 1900-1938. Photo courtesy of Bob Esposito. In 1938, James passed away and his 37-year-old son, Tony, took over operation of the family business. Like his father, Tony was an astute businessman who took pride in his work. He kept the business thriving even as other South Philadelphia bottlers went out of business, no longer able to compete with the big brands. However, during the early 1960s, the family business started to decline as bigger soda bottling manufacturers were able to operate more cheaply than Mom and Pop operations. In 1974, Tony Esposito closed the business, ending the family’s 75-year-run. James' son, Anthony Esposito, age 75. He owned the business 1938-1974. Photo courtesy of Bob Esposito. AUTHOR’S NOTE: I am indebted to R.J. Brown of Tampa, Fla., for permission to use his images of the flag-embossed sodas; to Robert "Bob" Esposito, James’ grandson, for his Esposito Family History; to the South Philly Review story, "Bubbling Up," by Lorraine Gennaro. Material also was used from my story in the October 2004 issue of Antique Bottle & Glass Collector, "J. Esposito, The King of the Koca Nola Franchise." I would like to hear from anyone with information about the James Esposito family and artifacts such as bottles, business envelopes, letterheads or billheads. Charles David Head, 23549-001, P.O. Box 150160, Atlanta, GA 30315.